Posted on Fri, Feb 3, 2012 : 9:14 a.m.
Workers at the site of a water main break on South State Street in Ann Arbor Thursday. 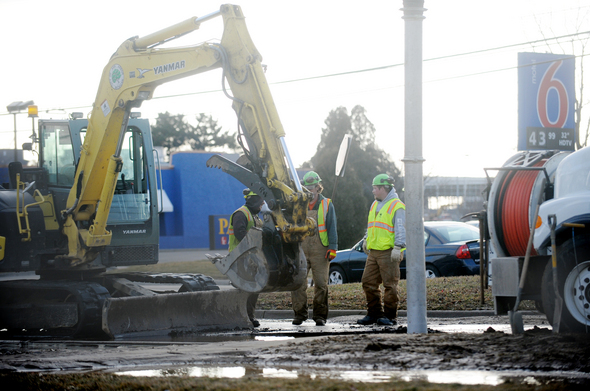 A broken water main on South State Street in Ann Arbor has been fixed, but street repairs will keep traffic in the area congested Friday. Lisa Wondrash, communications director for the city of Ann Arbor, said the repairs were finished early Friday morning and the street was reopened at 7 a.m. However, street repairs necessary after the work will restrict South State Street to one lane between Research Park Drive and KMS Place from 9 a.m. to 2 p.m. The city advises motorists to seek an alternate route. City officials Thursday said a contractor working in the area of South State Street and Research Park Driver broke a water main. Officials closed the northbound lanes of South Street about 4 p.m. after the break. Two businesses in the area were advised to boil water after the repair, Wondrash said. In addition, the city said that work that was scheduled for westbound Plymouth Road between Green and Commonwealth, has been rescheduled for Sunday at 10 p.m. until Tuesday, Feb. 7 at 6 a.m. During this work travel will be reduced to one lane in both directions on Plymouth. Fri, Feb 3, 2012 : 5:50 p.m. I wonder if it's time to get a new Water TSAR? Fri, Feb 3, 2012 : 4:50 p.m. I work right by this site and went down to check out the mess. This has nothing to do with aging infrastructure and everything to do with poor back-hoe operating skills. Or carelessness. Or both. Fri, Feb 3, 2012 : 3:55 p.m.
How much evidence do we need before we are convinced that infrastructure is a serious issue in the US? The society of civil engineers estimates that replacing aging water, sewer, bridges, roads, gas systems will cost upwards of 500 Billion. Most of these systems are 80-100 years old. Things don't last forever. We have unemployed construction workers. Yet, we have politicians who think that government should do less. Do people believe the private sector will fix these public works? Fri, Feb 3, 2012 : 7:39 p.m. The article says that a contractor broke it. Do people believe the private sector will fix these public works? --- Sure they will. Where do people think tax revenue comes from? Fri, Feb 3, 2012 : 3:39 p.m.
What is it with the water main breaks in A2? I've seen at least 2 or 3 in the past few years along various areas of Plymouth Rd and now this one. Does our aging utility infrastructure need to be evaluated? However Ann Arbor want's to appear to the world you can't polish a cow pie. Dig deeper. Fri, Feb 3, 2012 : 8:16 p.m.
How do you figure the water main breaks on plymputh rd were the result of errant contractors? All 3 of the breaks happened with in a few yards of each other I believe this last one happened on a extremely cold morning. Fri, Feb 3, 2012 : 4:30 p.m.
Errant contractors were the same cause as the breaks on Plymouth Road in the past few years? Crazy coincidence! Fri, Feb 3, 2012 : 4:13 p.m.